Busy, Busy —- But fun! Wow, I have really been a slacker when it comes to keeping this blog up to date. I have been so busy trying to get caught up on quilts. 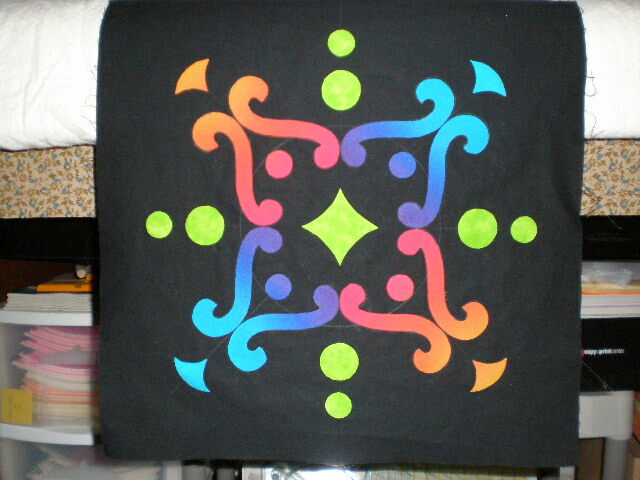 I usually complain that the only quilts I get in are custom, and that I seldom get any easy allovers to do. Well —- I finally got some (I think the next 5 I have to do), and I’m not liking it as much as I thought I would. Sure, it’s easy money, but it is soooo boring! And to make it even worse, they are all B.O.M.’s which are identical fabrics, I feel like I’ve been quilting the same quilt for a week now (and there are still more to do)!!!!! 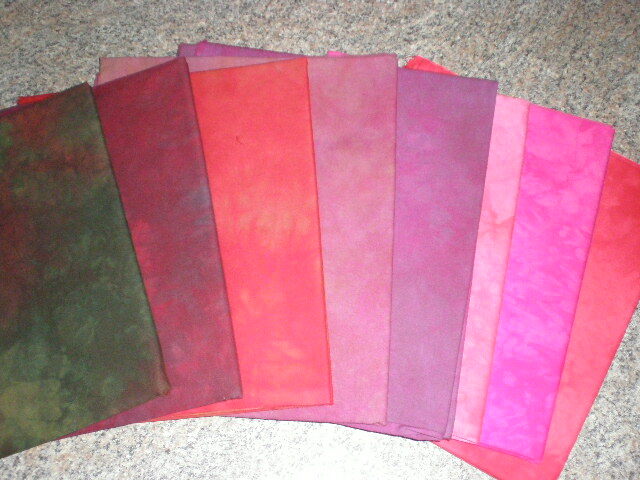 Last week I decided to take a break from the never ending quilts to do some fabric dyeing (which I haven’t had an opportunity to do for ages). Wow! I forgot how addicting it was —- and such an awesome artistic break from the monotony of those quilts. 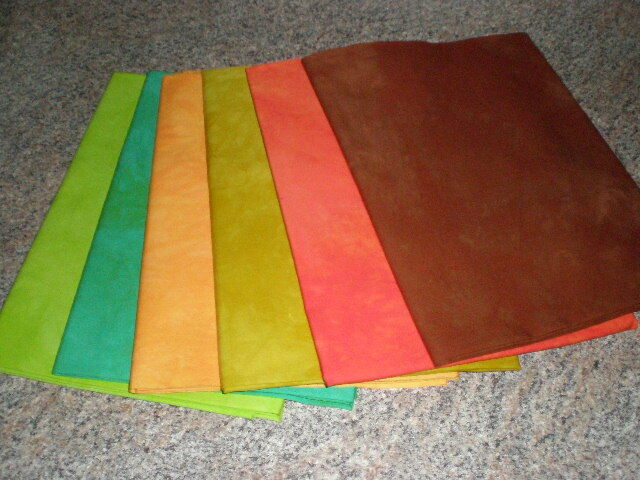 So, I decided that I am going to add dyed fabrics to my business (just what I need, something else to do <VBG>). 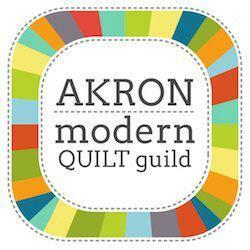 I figure I come into contact with alot of quilters at classes, shows, etc., so why not have it available for sale. And besides, if I don’t sell it ——- I get to KEEP IT! 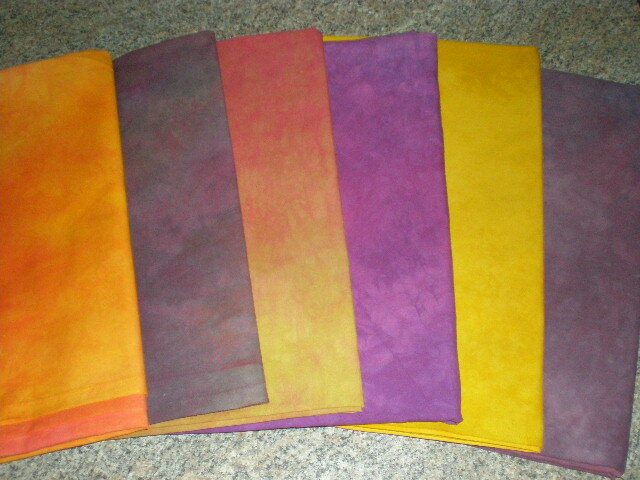 I dyed about 30 yards this past weekend, and have plenty more to go —- got a little carried away on the fabric, and now have approx. 100 yards still to play with. 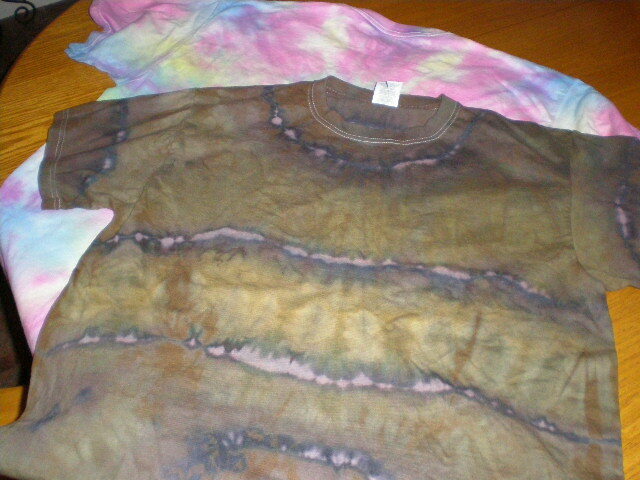 I actually had some help from my husband who was pretty in to it, about 15 minutes after I got started, he decided he wanted to dye himself some t-shirts, which turned out OK. I told him that really wasn’t the method for tie-dyeing, but he didn’t care, and could barely wait til it was time to rinse it out and see what it looked like. The second day, my son was mad that he had missed the whole thing, and “he” wanted to do a shirt. It was funny watching him ponder exactly where to put his gumbands and predict what the outcome would be. 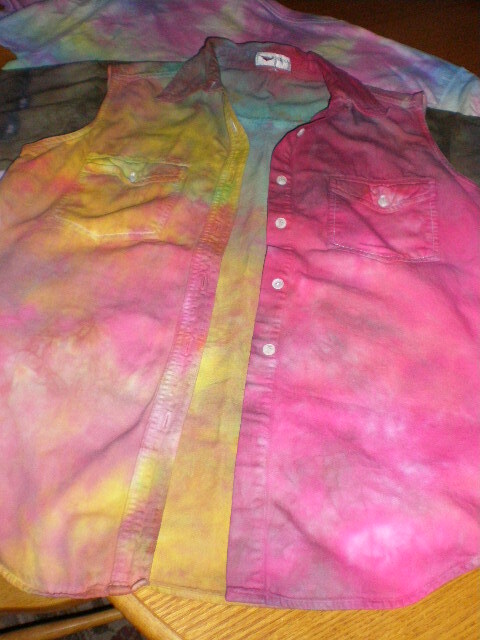 Only bad thing was that I was doing over dying that day, and the only colors I had mixed were brown and black. But, like DH the previous day, he didn’t care, and actually, I really like the way his brown and black t-shirt turned out. 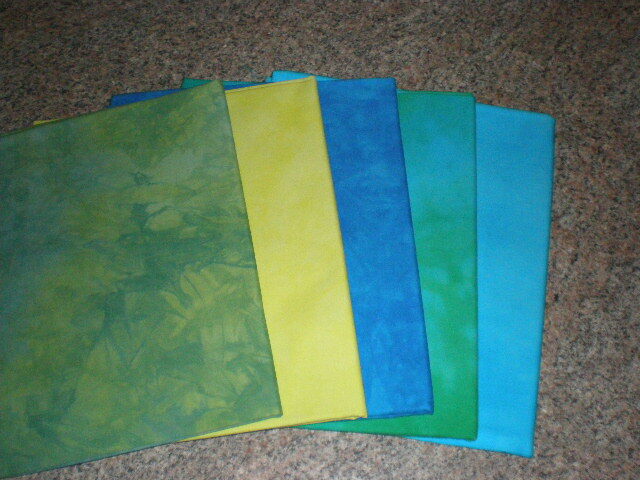 Here are pics of some of the fabrics (and of course the t-shirts). 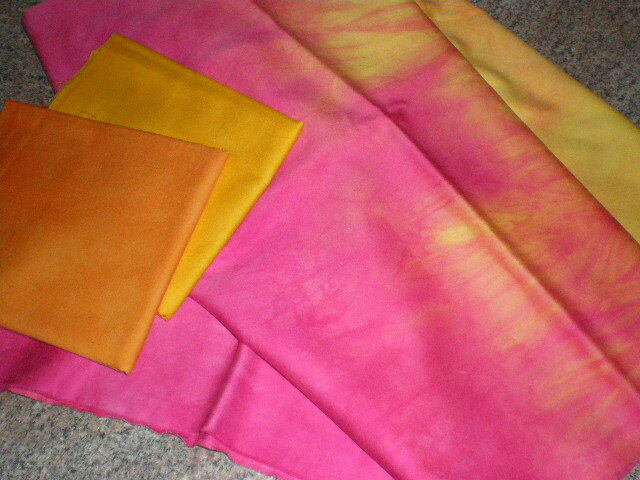 The sateen below is my favorite to dye! I have also been working on hand appliqueing this little piece the past couple of weeks. I decided that I needed something that I could work on in the evening if I sit down to watch TV (so I can feel like I’m getting something done at the same time <BG>). It’s only a tiny thing, but I was worried that anything much bigger might never get done. OK, better get back to the never ending ALLOVER quilting!!!!!!! ← Finally, “As Usual” is DONE!!! That looks like a lot of fun. I want to try dying, but I don’t know where to start. I like that little piece you made. Good luck getting through those BOM quilts! That pink, orange and yellow combo is yummy!